During the Anaheim Ducks' run to the Stanley Cup in the spring and summer of 2007, a new franchise icon was created -- the orange playoff towel. Suddenly, a team that was more known for its Disney roots is now seen as a team boasting a sea of orange towel-waving fans, "welcoming" opponents to Orange County. The orange playoff towels have since become an icon of the team recognized throughout the league. When the team reached the Stanley Cup Finals against the Ottawa Senators, things were taken a step further -- the orange towels started popping up at prominent Ottawa landmarks. The idea of a Ducks towel "invasion" was born. Growing up in Vancouver, I thought it would be interesting to start "invading" other places with my orange Ducks playoff towel. It got off to a slow start, but when I secured a job working overseas in Asia, it was suddenly possible to "invade" multiple countries in a single year. It was the best opportunity to do such a thing, and I decided to take full advantage of it. After a few months, it really began to take on a life of its own and evolved into the blog you see here today. By the time the journey was over, my towel had been to many daring excursions involving such locations as the Korean Demilitarized Zone, the Russian-Chinese border, the Great Wall of China, the shores of Hong Kong and the middle of Tiananmen Square. It had visited 8 different countries/territories and been within a stone's throw (sometimes literally) of an additional 2 countries/territories. And now I'm encouraging other Ducks fans to do the same whenever they're abroad. I want to do my own towel "invasions." Can I send them in? Of course. 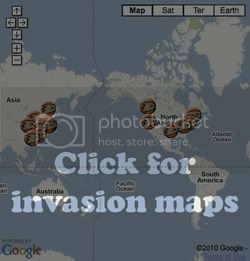 Click on the "Submit your own invasion" link on the left-hand menu. I want to "invade" places too but I'm not a Ducks fan. Can I do them for other NHL teams' towels? Nobody's stopping you. In fact, if you make your own towel invasion blog for another team, I'd love to exchange links with you (regardless of how I feel about your team). I want to "invade" certain places that are sensitive about security. Can I still send the photos in? I have "invaded" some sensitive areas in the past, and I don't recommend it. With that said, it is up to you if you want to take that risk. Don't hold me responsible if something happens to you. But if you survive to tell the tale and send the photos, I will put a disclaimer at the bottom of the blog post advising against future "invasions" of the location.